Primary Inspired: It's Time for Some History!! It's Time for Some History!! Yay! My favorite time of year is upon us! (Well-- my academic favorite time of the year). January/February just seems to be the time to do lots with US history.....we have Martin Luther King, Jr Day, Presidents Day, Black History Month. 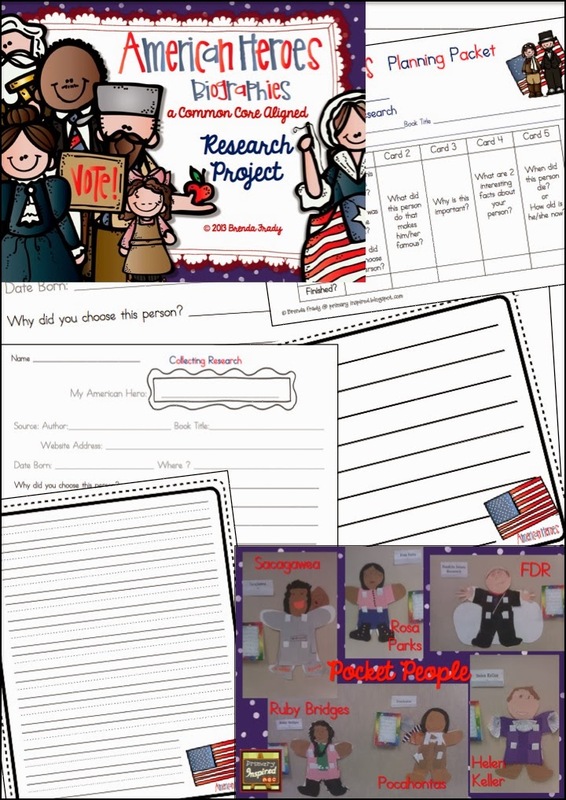 There are so many activities and projects you can do with American history. Oral reports in which they each dressed up as the famous American they'd researched. I just wish I could share pictures of the little guy who dressed up like George Washington! Complete with white ringlets! Adorable!! American Symbols Museum - small groups learned about different American symbols then worked together to create a display. We even had a couple kindergarten classes come in and tour! So much fun! And they learned so much!! 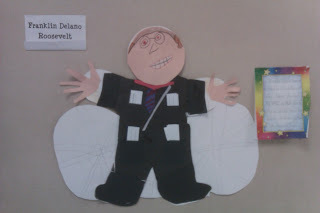 Love FDR's suit & tie! And check out the wheelchair! Check out the ruffles on Helen Keller's dress! Sacajawea - I love the baby peeking over her shoulder! When we did the Pocket People, my kiddos used them as the visual aid for their oral presentations. Information is written on each card, and the kiddos can pull each card as reference for the presentation. 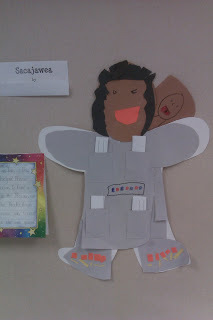 Afterward, we put the Pocket People up all over the school.....and they become interactive learning displays for everyone! How cool is that?! I try to put in all the support needed for my kiddos to be successful with both their report and their Pocket Person. Here are a couple of the tools I use to support them and keep them on track. I give each of them the cards you see on the right that have specific, guiding questions on them. The cards can serve as a planner for their writing...as well as info cards for an interactive learning display or as reference for oral presentations. Gotta love that! 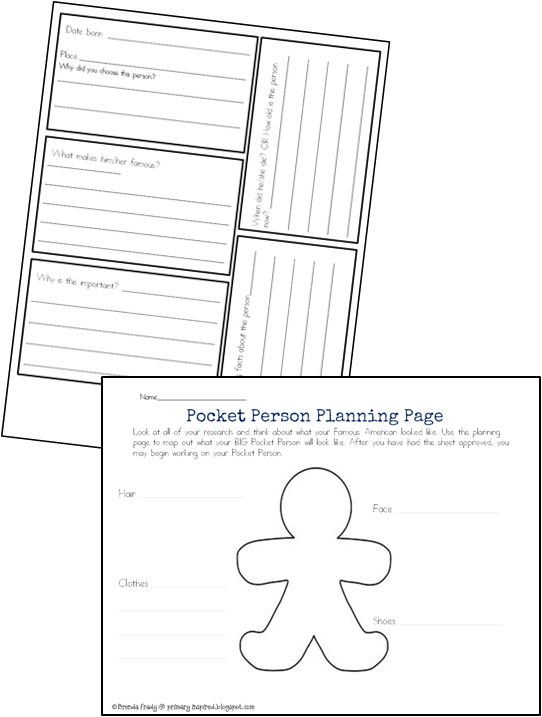 I also give everyone a planning page for their pocket person. I've labeled it so that kiddos are guided to create their pocket person with correct and appropriate detail. Remember that awesome FDR up there? Sacajawea and her baby peeking over her shoulder? The planning page and the support built in helped these kiddos get there. I also give them a rubric at the beginning of the project so that they know exactly what the expectations are, and how to get the score they want. If you've been following me recently, you know that I'm all about choice this year. With that in mind, as we gear up for the project this year, I am going to offer my kiddos choice this year. The written report will still be part of the requirements, of course. This year, they're going to get to choose between doing a Pocket Person or creating a persona for a Wax Musuem! Super excited about this!